SOV films were all the rage back in the 1980's through to the 90's but with the advent of digital, some (not all) of those directors made famous by their shot on video fare jumped ship. Now directors such as Tim Ritter ('REALMS OF BLOOD'), Brad Sykes ('CAMP BLOOD') and Todd Sheets ('ZOMBIE BLOODBATH') have come together to make an anthology film using 8 simple rules, one of which is to film their short on HI-8. There is eight shorts all wrapped together by a 9th short and while there is going to be at least one entry you will find disappointing I can assure you, you won't find any more then that. Everything from serial killers to zombies, action hero wannabes to paranoid girlfriends is covered in this love letter of pure independent gold. My personal favourite of the lot is 'Gang Them Style' shot by director Ron Bonk ('CITY OF THE VAMPIRES') which sees our action hero wannabe RJ 'Mongoose' Macready out to save his grandmother and her cronies from the brain munching zombies while giving us our fill of action movie one liners. If you have always wanted to know what each of the directors works are like but didnt want to spend your hard earned cash on one of their full length features you couldn't go wrong by picking this up. 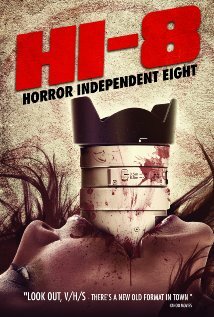 Overall 'HI-8 HORROR INDEPENDENT EIGHT' is a pleasure to view for fans of independent shot on video flicks and anthology films alike.